"A View of the Lake" B & B has been a consistent accommodation awards recipient almost since we first opened. We have been fortunate to receive many awards from different travel sites and entities, and we truly appreciate the wonderful feedback we have received over the years. Tripadvisor has become the world's largest travel site, where travellers rely on other travellers' reviews. Their unbiased system is based on reviews from individuals, who can state their personal opinions without sanction. Steve and Chrissy Marston, owners and hosts at A View of the Lake Bed and Breakfast located in West Kelowna are exceedingly pleased with the 5-star reviews they receive on a consistent basis, which validates their aim, which is to offer the best service possible to all their guests. A View of the Lake Bed & Breakfast is proud to be a 2019 Travellers Choice Award recipient, which is tripadvisor's highest honor. This award identifies and ranks the very best businesses in specific categories and geographies. 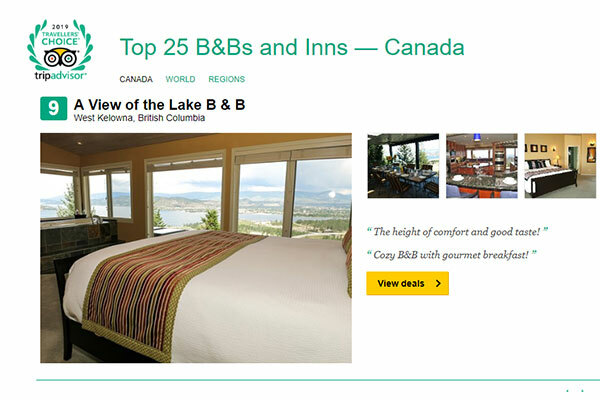 Based on customer reviews during 2018,A View of the Lake was named number 9 out of the top 25 across Canada in the category of "B & B and Inns" . Tripadvisor awards their "Certificate of Excellence" based on a business maintaining an overall TripAdvisor bubble rating of at least four out of five, have a minimum number of reviews and must have been listed on TripAdvisor for at least 12 months. A View of the Lake B " B has qualified every year since 2011. In addition, Tripadvisor also bestows "Hall of Fame" awards for qualifying for Certificates of Excellence for a 5-year in a row period. Our Bed and Breakfast has now received this award twice in a row, covering all years from 2011 to 2019. 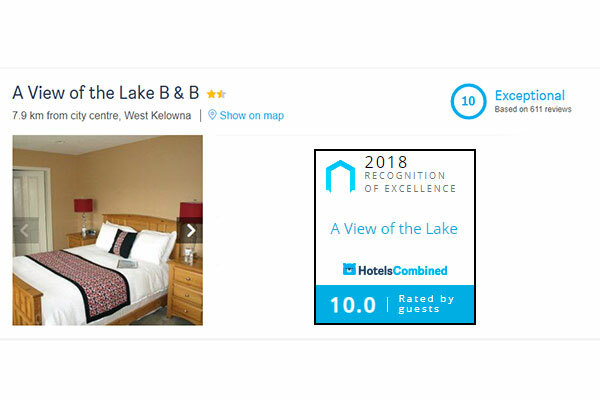 HotelsCombined is a travel site which invites reviews from travellers and our Kelowna area bed & breakfast A View of the Lake B &B ranks highly in reviews as well. We are proud to be 2018 Recognition of Excellence Award recipients from HotelsCombined.com, which is based on the reviews sent in by guests to our West Kelowna Bed & Breakfast. A current check of our standings still shows the exceptionally high rating of 10, based on over 600 customer reviews, for which we are once more very grateful. BedandBreakfast.com is a travel site with awards given both annually and monthly. 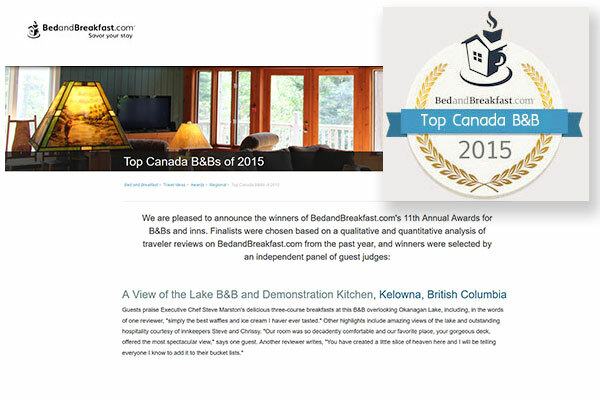 We were exceptionally proud to be named Top Canada Bed and Breakfast in 2015 by the BedandBreakfast.com travel site, which is affiliated with Expedia. A View of the Lake B & received the 2018 " Exceptional" guest review award, based on a score of 98%.